When it comes to writing software, maintaining software, or simply trying to understand software, a debugger is one of the most powerful tools that we can use. or if I’m just missing other developers who talk about it. Regardless, if an IDE doesn’t have a built-in debugger, it’s not too difficult to set up Xdebug and get started using it. And once you do start using it, you learn much more about how a given piece of software performs regardless of if you wrote it or if someone else wrote it. Yes, I’ve written on this topic before, but I recently stumbled across an article that I found to be a really good break down of how to shift one’s thinking into a mindset for debugging. This is going to sound a bit like a book review or a cliff notes version of someone’s work. That’s because it’s supposed to and I’ll cover why later in the article. So here’s the gist: In The Debugging Mindset, the author covers about eight points about debugging and intelligence. I think all of them are relevant and worth a read, but I won’t cover them all here. Clearly, there’s a lot of psychology to debugging. But if this research exists around this particular topic in computer science, why aren’t those of us who are programming on a daily basis employing any of this? We can get better at what we’re doing through practice and by using some of the material mentioned in the article. A Post on Someone Else’s Article? Why write an entire post about someone else’s article? I know. It’s not something I regularly do, but this is a bit different. First, it’s one thing to share it on Twitter but those types of shares go flying by when someone else shares a thought. Secondly, if an article feels too long to read at a given time, it might be overlooked. And when that happens to really good material – especially when it’s something that I think could benefit those who are working in our industry – then I think it’s worth sharing. And, as I stated at the beginning of this post, developing a mindset for debugging is key. In my experience, it comes after you’re used to using a debugger long enough. In short, you start to think like the debugger. But if you’re able to shortcut that particular step by even a little bit, why wouldn’t you? 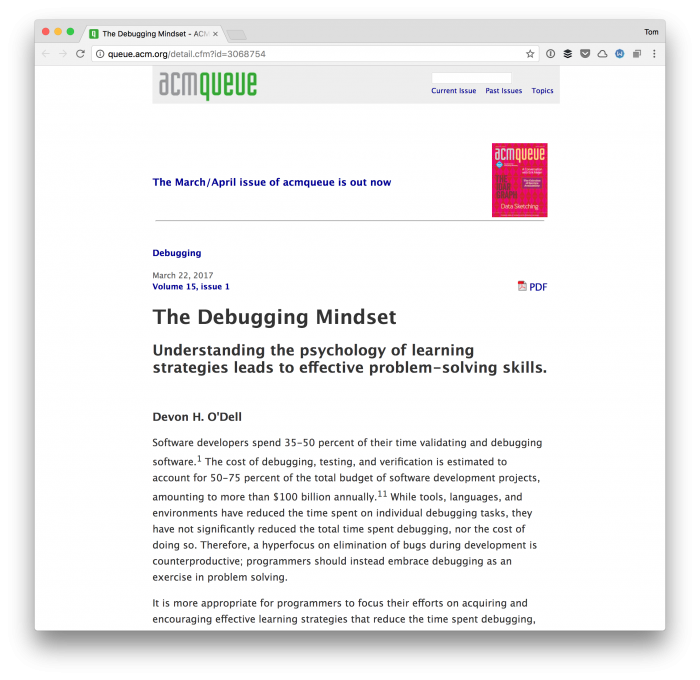 And that’s what I think is great about the aforementioned article: It presents the information on a mindset of debugging well enough such that those who use it prior to using a debugger may be better prepared for it. Above all else, though, it’s far more productive, useful, and powerful to use a debugger than some of a language’s built-in facilities for examining data structures. And I’d think it’s important to share that with those of us working in WordPress.